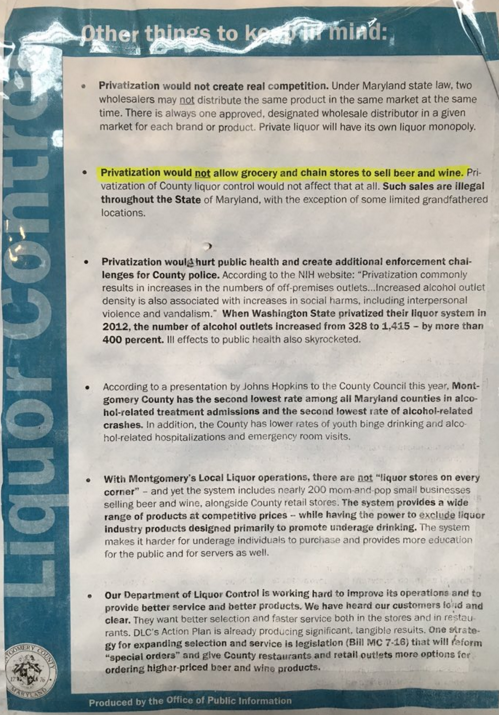 Montgomery County's political machine is in full panic mode as public opposition to the County government's monopoly control of liquor increases in volume. Punches are being thrown, and landing. But new government signs printed at taxpayer expense are threatening those very taxpayers with "sky is falling" outcomes and punishments, should the unwashed masses dare to boot Big County Government out of the liquor business at the ballot box this November. This follows another taxpayer-funded propaganda campaign to maintain the monopoly that I reported on just yesterday. 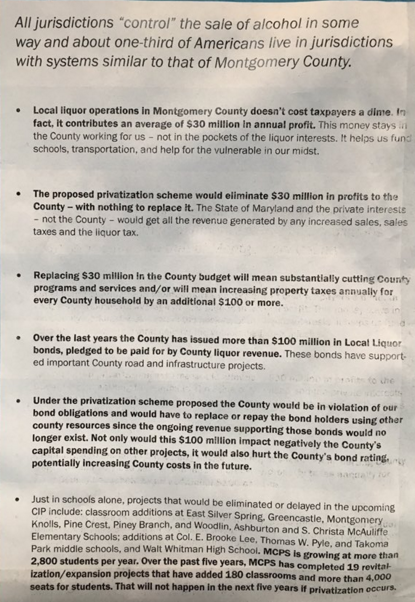 The County is even using schoolchildren as human shields, threatening to derail construction projects at Walt Whitman, Pyle, Ashburton, East Silver Spring, Greencastle, Montgomery Knolls, Pinecrest, Piney Branch, Woodlin, Christa McAuliffe and Col. E. Brooke Lee if voters reject the government liquor monopoly. This even as many of the same elected officials are clamoring to approve classroom-busting, high-density development in those same school clusters in the coming months. Oops. What else will happen if you pursue your quest for better beer and wine lists, and the right to purchase Bud Light at CVS? "Liquor stores on every corner," thunders the sign. Here's a good one - the monopoly actually touts its authority to keep certain liquor products it arbitrarily decides are a little too wild for you, the heavy-tax-paying adult, out of your hands. Boasting of its "power to exclude" certain products - now there's a heckuva way to convince residents that this is a good system. Just what we want: less choice, right? They also made another gaffe in the process - they state that Montgomery County is only the second-best jurisdiction in Maryland when it comes to alcohol abuse and drunk-driving accidents. So we're not the healthiest in America, as our elected officials boasted? No, not even in the state, according to the County's own propaganda. Councilmember George Leventhal tussled on Facebook with restaurateur Roberto Pietrobono (Gringos & Mariachis, Olazzo), who asked, "At what point in time would you be fed up if you were in our position as restaurant owners? For me it's been 15 years." Leventhal replied that he hoped the proposed "special orders" change would solve Pietrobono's woes. Alas, as regular readers here already know, the "special orders" plan won't do that. It will allow the Department of Liquor Control to retain the power to declare which products are special order. It will allow the DLC to levy a tax on those new private liquor transactions, which as anyone who knows about business realizes, will raise the cost of product for consumers and hospitality businesses (of course, the County Council is not known for its vast knowledge of operating businesses). How does that make Montgomery County competitive with the District again? Are you smart enough to decide the fate of liquor control in Montgomery County? According to the Sentinel newspaper, Councilmember Leventhal says you aren't. Of Leventhal's opposition to a ballot referendum on the issue, the Sentinel reported "he did not think voters should decide whether to privatize alcohol because they would not understand how it would affect the county. Leventhal posted that he thought only restaurant industry insiders were concerned about the County having monopoly control of liquor. But his colleague, Councilmember Hans Riemer, who also favors government retaining monopoly control, recently acknowledged the biggest complaint heard is the inability to buy beer and wine at grocery stores. It's clear that the people have spoken. Now, will the politicians listen? As a resident, is your current inability to buy Bud Light or a bottle of chardonnay at Giant, and your being forced to pay more for alcohol than those in the District, really "of little interest" to you? The picture you posted does say that only certain locations of "chain stores" in the state are allowed to sell alcohol by being grandfathered. So would you be able to purchase alcohol at a local CVS? Nope, it's a state law that prohibits the sale of beer and wine in grocery and convenience stores. I'm unsure how exactly the grandfathering works, in MoCo, each chain that was around when the law first took effect gets one location in the county (Safeway in Olney and Giant in White Oak come to mind). On the eastern shore many gas stations sell beer and wine, but still not convenience stores or grocery stores. Worcester Co had a control model like MoCo that was broken up a couple years ago, and Wicomico Co allows the beer and wine stores to private source, but you still have to go to a County run store for liquor last time I checked. This issue and our MoCo leaders response to it make me sick and I don't know how to summarize my feelings into a concise response. This is my best attempt. George Leventhal and the rest of our County "leaders" are laughable. Hans Riemer and his "halfway" attempt to make everyone happy with special orders is a bad Band Aid on a flowing river. It's not that "people" (consumers) dont care Mr. Leventhal, it's that many shop in DC and VA for beer, wine and alcohol and we like it and we're used to it. "You guys" have argued this issue to death, always to the detriment of the consumer, and many of us frankly just don't care to keep playing the same game. We dont have to. We aren't invested in it like the restaurants and retailers that you handicap. I didnt sign Berliner's petition because it has no effect on the outcome and I sort of enjoy shopping at Trader Joes and Total Wine in VA and Calvert Woodley in DC. I would miss "stocking up" when I'm in VA and DC. 30 years ago I would have to double back into DC to avoid to DLC guys who would pull you over crossing into DC with "contraband" but that doesnt happen anymore...yet. My family and my parents/step parents spend thousands every year outside of our County system. We have a couple hundred bottles of wine, a modest liquor cabinet and a case or so of beer and I'm sure that less than 5% of it came through the County system. This is how you get the system changed. Vote with your $. Do frequent our restaurants...they are held hostage. Do visit Gilly's, Belby's, Beer and Wine in Bethesda, Olney Fine Wine and the various specialty wine merchants in MoCo...they are trying and they mostly know their product and care about satisfying their customers. But, dont shop at the County Liquor stores. Buy your alcohol in DC or PG County. Buy your beer and wine from local merchants who are trying to bring service and selection to the MoCo consumer. Don't keep feeding a bad system! Full disclosure: I had to buy a bottle of sherry 3 weeks ago for a recipe so I went to a County store. The first clerk was checking out a customer and the 2nd clerk saw me and he did get up from the back room to help me but he continued to play Candy Crush on his phone while ringing me up. He actually paused twice during the transaction to attend to his game. The transaction took about 30-60 seconds more than it should have because of this. The time isn't the issue of course. I dont recall a cashier actively playing video games while checking me out at any of the stores above. Then again, I was biased going in so the experience met my expectations. Beer and wine is surely cheaper in DC and VA but it will likely stay that way even under a private MoCo model because state wholesale taxes are higher here than in those jurisdictions. All that would change is probably better access to non name brand product. If you buy your liquor in VA you are likely over-paying quite a bit, as the local liquor prices are as low as I've ever seen them anywhere. If you wish to not fund the system that's fine, but don't pretend your getting a deal on hard liquor elsewhere. I can't speak to the employees, I've found it's hit or miss. About 50% are great, go out of their way to find something or ask if they can help, and 50% are like your candy crush experience. I buy very little liquor and none of it in VA. DC prices at Calvert Woodley, Pauls, etc (Corridor in PG County) are lower if I watch sales but again I dont buy but a few bottles a year. There is more to it than price though. I was trying to be brief. I can understand what your experience is but at least for me and my friends in the county, we have not seen that the cheaper cost of getting alcohol in other counties is worth the gas you spend going to get it let alone the time. Now I will admit that my tastes and that of my friends is on the "humbler side" so we don't buy expensive alcohol. Maybe that affects our costs. But it's like you said, we do not a vested interest in the restaurant business so if they can't get what they ordered oh well. It has happened that I have thought about getting a special order but with the system in place I have decided not to. All in all, while I agree that the system is very awkward, if what the information that the county provided is true, then buying alcohol will remain the same aside from the ability to sell spirits. I'm sure Robert is looking into my first question as I have stated that the bar and restaurant side of it is none of my concern. The way I see it, these establishments are not going anywhere because there is money to be made. I do not see why we should make it easier for them without making it easier for us to purchase where we want. Part of the change would be to allow private retailers to open up liquor, beer and wine stores, and to source their product from wherever the owner chooses. The compromise the County is offering is to let beer and wine stores (that exist already) to source special orders privately and buy name brand product from the County. The County's plan would not allow for private competition on the liquor side. I agree with you the prices (of hard liquor) locally are great and I don't drink wine enough to care about the price or selection. I'm not totally against privitizing the system, but there are costs involved, it'll be used as the excuse to raise taxes, and there's a risk that a lot of small, ill stocked expensive corner stores will open up, and I will have to drive further out of my way within the County to find one of the more reasonable venues. It's how it is in Baltimore County now so I don't see why the same wouldn't happen here. Thanks for you reply - I also found an answer on www.rockvilleview.com as to my question. While I share some concerns in how the system is run, I cannot see how this call to shut down the DLC benefits anyone but the wholesale distributors as we would have to foot the bill for all the lack of funds not coming in by dismantling the DLC. I am fine with the Liquor Stores as long as I do not have to pay more in taxes. Consumers and small business (restaurants and retail beer and wine) benefit Ed. We benefit with better selection, better service and better pricing. There have been several studies done showing the sale of liquor licenses and the additional sales tax (from out of county money being spent back in county) would more than make up for the loss of revenue. Economics is complex. 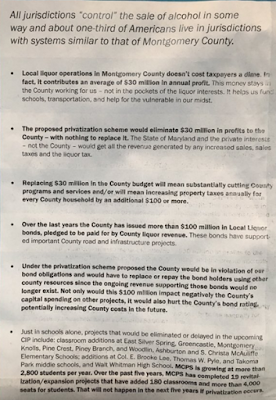 The County argument is simple math; we make $30 million and it will be gone if we don’t keep it the way it is. If this system benefits county residents then we really should get into the retail gas business. “Evil” oil companies are benefitting from our purchases. I know many station owners are small business people but hey, they can just find another business. We could model this system after the DLC. Employees would be union members and we could go a step further and create additional jobs by eliminating self-serve (without a price increase) as NJ does. We could lease the retail and service bays or get involved in that too. Stations that have convenience stores would “benefit” from the DLC’s retail experience and those that have auto service facilities would be training grounds for tech students from community colleges. Thank you for you information. I understand your point that there may be a benefit to the county by having people come back and spend their money on alcohol back in the county but I still don't agree. We may be seeing a lot of restaurants go under in the county but it is not solely because the DLC is inefficient. Likewise, I have yet to see a beer and wine store go under in my area of Rockville. What I mean to say by this is that small business is doing just fine. My family has operated a small landscaping business with a degree of sucess for over 30 years in the county so I think I would know a little about small business. It is has not been perfect or easy but being successful rarely is. I do not believe that paying less for my Bud light would justify me paying more in taxes. Furthermore, if the $2 that I save buying in other municipalities is a concern to me then I have no business drinking. Additionally, like another poster on here said, I have not seen cheaper prices for liquor elsewhere and I can usually find what want so the experience some have at the liquor store is not what I get. The county's argument, so far as I can tell, is not simply that losing $30 million dollars in revenue (after salaries are paid - I could be wrong on this though) will be bad for the county but that we the taxpayers will have to pay out that money because as Robert posted, the money is tied into bonds. Now honestly, I confess that I do not know enough about the financials of the county so if I am wrong then please let me know but it would seem that taxpayers would have to foot that bill. I have no problem paying taxes but I would rather it benefit real people with jobs then the pockets of businesses that are making money anyways. Sorry for being long winded and simple but this subject is complicated and I think this dialogue is good to have. I'm glad Robert doesn't beg readers to "donate" money to his site.